Gerrit Scott Dawson (ed. 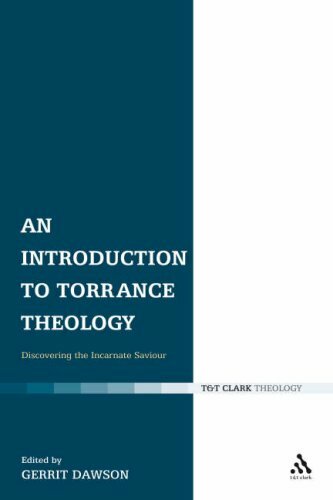 ), An Introduction to Torrance Theology: Discovering the Incarnate Saviour (London: T&T Clark, 2007). viii + 179 pages. ISBN: 9780567031815. Review copy courtesy of Continuum. The year was 2001. I was away on holidays in Echuca, ‘the paddlesteamer capital of Australia’. The previous week had seen a serious number of books turn up in my letterbox – just in time to take them away in anticipation of finding some space to peruse them. As usual, I was overly ambitious about just how many books I would ‘get through’. In fact, the only book I remember reading (and then re-reading) that holiday was the just-released How to Read T.F. Torrance: Understanding His Trinitarian & Scientific Theology, by Elmer M. Colyer. I remember the doxology that accompanied the reality that someone had finally put together an introduction – and a stunning one at that – to the thought of the most significant British (and arguably English-speaking) theologian this century. I also remember thinking that as richly profitable as Colyer’s introduction is, its size (393 pages) and depth would probably (and unfortunately) be a barrier to many who are not ready for a Torrance main course, and that I hope that someday someone writes a briefer (but no less constructive) entrée to TF Torrance’s thinking. Finally, that day has come with the arrival of An Introduction to Torrance Theology: Discovering the Incarnate Saviour. The book is precisely what its editor, Gerrit Scott Dawson, claims: a welcoming and accessible introduction ‘for those just testing the Torrance theological waters, yet intellectually rigorous enough for serious engagement by fellow scholars’ (p. vii), opening up and inviting us to explore new theological vistas. The volume consists of a diverse collection of papers delivered in March 2006 at the First Presbyterian Church of Baton Rouge, Louisiana (USA). It was the largest-ever gathering of scholars (many of whom are former students of a Torrance; a testimony in itself to the ongoing contribution that the Torrances have made, and continue to make, not just in Scotland but around the world) who had come together specifically to reflect on (and celebrate) the theological distinctives and contributions of a family that has for more than six decades had an extraordinary influence on theological and pastoral work, the brothers Torrance – David, Tom and James. The church team, and T&T Clark, is to be congratulated for hosting such an exceptional event, and publishing its fruits. The anthology begins with a piece by David Torrance wherein he briefly but illuminatingly introduces us to the Torrance family traditions and theological values that have informed their Christ-centered theology. On the way, he gives us an insight into the devotional and pedagogical life of the home in which he, Thomas and James were raised – a life characterised by family worship, prayer and the reading and memorisation of Scripture. As children, the Torrances were introduced to Luther on Galatians, Robert Bruce on the Sacraments, and Calvin’s Institutes. (Apparently, they never watched the antediluvian equivalent of The Simpsons!) He properly reminds us that the Torrances, though deeply honoured by the consideration given to their work, would wish to resist any suggestion of a ‘Torrancian theology’: ‘We have given our understanding of the Word of God. We encourage members of the Church to read the Bible and discover for themselves what God is saying and discover whether what we have said helps towards a deeper understanding of the gospel once committed to the saints and treasured by the evangelical church through the centuries’ (p. 1). As this volume bears witness, many have certainly been so helped. Andrew Purves explores the christological question: ‘Who Is the Incarnate Saviour of the World?’ and its priority over the attendant ‘How’ questions. He attends to the significance and priority of beginning all theology with the person of Jesus Christ. Christology precedes soteriology, and ought be given first and controlling place in any creed. He argues that Jesus Christ is him who entered into our weak, fallen, and rebellious humanity, penetrating to its very heart in its alienation and rebellion in order to redeem humanity and all creation. He suggests that evangelicals are too often not radical enough in thinking through the meaning and centrality of Jesus Christ, and too ready to replace him in priority with foundationalist, previously determined and independently derived, theistic and metaphysical assumptions that are then ‘clamped down upon the gospel’ (p. 29). In his compelling essay, Elmer M. Colyer turns our attention to T. F. Torrance’s thinking on the atonement, reminding us that this Torrance’s mission has been to clarify the deep structures that are embedded in the very reality of the gospel itself. Colyer is concerned to highlight that in no sense (and at no stage) does the incarnation drive a wedge between the three persons. A significant proportion of his essay, however, is given to the matter of Christ’s assumption of fallen humanity and the need to qualify the judicial elements in the atonement in light of the tendency in Western theology, from the fifth century on, to embrace the notion that Christ assumed a ‘perfect’ or ‘neutral’ human nature. This Torrance coins the Latin heresy, suggesting that Christ’s atoning sacrifice, in this view, can only be understood in terms of external relations between Christ and humanity’s sin. The ‘Latin heresy’, it is understood, undermines believers’ assurance and confidence that our great High Priest really has entered the brink in his full identification with humanity, and so can truly sympathise with us in our weakness. Torrance, Colyer writes, ‘develops a participatory scientific theology in which our actual knowledge of God, that comes to us in and with God’s atoning self-communication through Jesus Christ and in his Spirit, calls into question all alien presuppositions and prior conceptual frameworks embodying what we think we know about God, for everything in theology has to be related to God’s Trinitarian self-revelation and self-communication to us in the gospel’ (p. 33). Like Purves, Colyer concludes his essay with a brief recapitulation of T. F. Torrance’s twin rejection of the two heresies of limited atonement and universalism. The important notion of Christ’s assumption of fallen humanity, found so richly in John McLeod Campbell and replayed in the Torrance’s theology, is further taken up in Gerrit Scott Dawson‘s study, ‘Far as the Curse is Found: The Significance of Christ’s Assuming a Fallen Human Nature in the Torrance Theology’. Dawson grants considerable space in his paper to the posse non peccare debate in christology. Douglas F. Kelly outlines T. F. Torrance’s realist epistemology, arguing that Torrance’s biblical and scientific realism is ‘his greatest contribution to the theological life and mission of the Church for ages to come’ (p. 75). In Alan J. Torrance‘s moving essay, ‘Towards a Theology of Belonging: Key Themes in the Theology of J. B. Torrance’, Alan honours his father by reaffirming truths that lay at the centre of his father’s, and his own, theological heart: the distinction between indicatives and imperatives in the covenant, a filial rather than legal relationship between humanity and God, and evangelical versus legal repentance. Significant space is devoted to the great overarching theme of all these: covenant. God’s covenant with humanity is unconditioned by human response, is unilateral and is not – in any sense of the word – a contract. He writes: ‘To translate God’s covenantal relationship into contractual terms in order to manipulate people into either repentance or conversion clearly amounts to a betrayal of the life of the Body of Christ and the form of our participation in God’s Triune life. It is to supplant the free, loving and transforming activity of the Holy Spirit, with the worldly manipulation of people’s self-interest – by either the use of fear or the promise of reward’ (p. 106). Graham Redding, who was I believe one of Alan’s students in New Zealand, offers us a helpful reflection on Reformed theology and current trends in worship entitled ‘Calvin and the Café Church’. Commenting on the emerging church, he suggests that ‘many developments and experiments in worship that accompany talk about the emerging church are taking place in a theological vacuum. Ignorance of the classic liturgies and what they have meant to the Church down the centuries, ignorance of the liturgical theology of Calvin and Knox [he is a Presbyterian! ], ignorance of the role of ordained ministry, will lead ultimately to an impoverishment of Reformed worship and a detachment of corporate worship from its Reformed, early church and indeed Jewish roots. Some would argue that that is happening already. Marva Dawn, for example, talks about the dumbing down of worship right across the Church. That which we regard at one time as bravely navigating uncharted waters could with the benefit of hindsight turn out to be symptomatic of us having lost our way’ (p. 131). Gary W. Deddo‘s essay reminds us just how practically- and pastorally-informed the gospel that the Torrance brothers have dedicated their life to preaching is, with weighty pertinence for how we understand and practice prayer, social justice, racial reconciliation, worship, evangelism, church renewal, mission, and pastoral ministry – indeed, all of life. The Christian life truly is a participation in Christ’s continuing ministry. The final chapter, ‘The Hermeneutical Nightmare and the Reconciling Work of Jesus Christ’, is an offering from one of James Torrance’s former students, C. Baxter Kruger in which he creatively reiterates the revelation of the Father’s heart in the ministry of the Father’s Son. Echoing many of the themes in his books, and not least his latest publication Across All Worlds, Baxter – with all the passion of a great evangelist who is convinced that what he has to share really is good news – contends that Jesus wants his Father known. He is passionate about it. He cannot bear for us to live without knowing his Father, without knowing his heart, his lavish embrace, his endless love – and the sheer freedom to be that works within us as we see his Father’s face. Jesus knows the Father from all eternity. He sits at his right hand and sees him face to face, and shares life and all things with him in the fellowship of the Spirit. How could he be content, Kruger asks, to leave us in the dark with no vision of his Father’s heart? How could the Father’s Son be indifferent when we are so lost and afraid and bound in our mythology? Burning with the Father’s love for us, inspired with the Spirit’s fire, the Son ran to embrace our broken existence, baptising himself into our blindness. He braved the seas of our darkness to come to us. Why? So that he could share with us his own communion with his Father in the Spirit, and we could know the Father with him, and taste and feel and experience life in his embrace (p. 157). The volume helps to clarify many of the areas of contention in the Torrance tradition (for example, the notion of Christ’s assumption of fallen flesh, the rejection of any suggestion of limited atonement, and christological universalism receive adequate treatment by not a few of the essayists), while recapitulating some of the great themes of the gospel so central to the heart and thinking of its main proponents. I would have loved to have seen included a paper identifying the critical sources to the Torrance brothers’ thinking, especially Athanasius, the Cappadocian Fathers, John Knox, Robert Bruce, Thomas Erskine, Edward Irving, John McLeod Campbell, Karl Barth, and others. (McGrath’s biography of T. F. Torrance is most helpful here). The collection betrays some of the realities of repetition that inevitably accompany any group of papers which concern themselves with the heart of any tradition. This, however – at least to this reviewer – is a picayune and inconsequential price to pay for being reminded of such significant realities and of the enormous debt we owe to this extraordinary family for faithfully re-making these gospel realities known. An Introduction to Torrance Theology: Discovering the Incarnate Saviour is the most accessible introduction of which I am aware to TF and JB Torrance’s exceptional legacy and thought, serving as a brilliant teaser to go and read the primary works themselves. Each contributor explores the contemporary relevance of Torrance Christology, and areas of ecclesiology, missiology, pastoral ministry and epistemology are all helpfully attended to. Those who devour this excellent entrée will no doubt go on to indulge likewise with the main course (I suggest The Mediation of Christ, and Worship, Community & the Triune God of Grace). An absolute delight to read, and commend! Thanks for this Jason. I didn’t know about the book. The review of the book Torrance theology is very good and clarified many doubt’s on theology I thank the editor Gerrit Scott for his wonderful script on the book. thanks Jason for that great review! I just discovered and we’re appreciative!